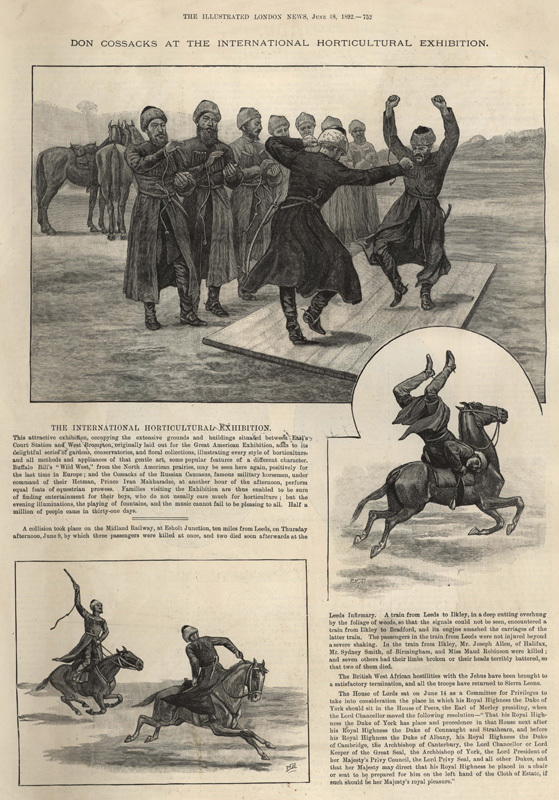 DON COSSACKS AT THE INTERNATIONAL HORTICULTURAL EXHIBITION. This attractive exhibition, occupying the extensive grounds and buildings situated between Earl's Court Station and West Brompton, originally laid out for the Great American Exhibition, adds to its delightful series of gardens, conservatories, and floral collections, illustrating every style of horticulture, and all methods and appliances of that gentle art, some popular features of a different character. Buffalo Bill's "Wild West," from the North American prairies, may be seen here again, positively for the last time in Europe; and the Cossacks of the Russian Caucasus, famous military horsemen, under command of their Hetman, Prince Ivan Makharadze, at another hour of the afternoon, perform equal feats of equestrian prowess. Families visiting the Exhibition are thus enabled to be sure of finding entertainment for their boys, who do not usually care much for horticulture; but the evening illuminations, the playing of fountains, and the music cannot fail to be pleasing to all. Half a million of people came in thirty-one days.